JEFFERSON CITY, Mo. — The leadership of both chambers of the Missouri General Assembly has called for the embattled-governor to take responsibility for his actions and to step down from his position. The Senate President Pro Tem took it one step further calling for impeachment proceedings to begin. Following the news that the state’s Attorney General has evidence to support another felony charge against Gov. Eric Greitens in combination with the House report released less than a week ago, Republican leadership is making the resignation call for the first time. “At the outset of this process, we said the governor needed to be forthright and accountable for his actions. After thoughtful consideration of the findings in the House committee’s report and today’s news that the Attorney General has evidence to support another felony charge, we believe the governor needs to take responsibility for his actions,” said House Speaker Todd Richardson, House Speaker Pro Tem Elijah Haahr, and House Majority Floor Leader Rob Vescovo in a joint statement. Senate President Pro Tem Ron Richard took that a step further and called for impeachment proceedings to begin. “For the last several months, I have been in constant contact with the speaker of the Missouri House of Representatives and the Missouri attorney general. We have reached a critical turning point in the allegations made against the governor. 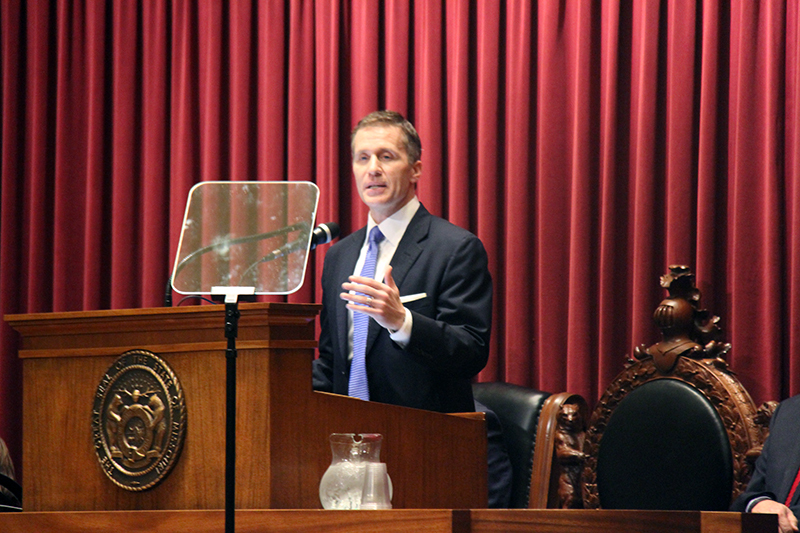 The decisions made going forward will have a significant effect on the state of Missouri. After speaking with the attorney general today, I believe the governor has no other respectable option than to resign from office,” said Richard. “We are past the point of concerning and alarming. Since his time in office, the governor has caused tension, conflict and hostility. The weight of his actions are being felt throughout the state. Now, these alleged illegal actions are further harmful to the people of Missouri and do not represent Missouri values. It’s time for the governor to find the courage in his heart and do what is in the best interests of the people he serves and step aside. “This is not a sentiment held lightly. Serving the people of Missouri is an extraordinary honor, one I believe requires each elected official to rise to the occasion. Sometimes that occasion is knowing when it’s time to step aside. Following the release of the two statements Tuesnight, Greitens took to Twitter reaffirming his conviction that he will not resign. Early on Tuesday, the Josh Hawley announced evidence of criminal wrongdoing at a press conference, saying he had handed to evidence to the St. Louis Circuit Attorney and the House Investigative committee. This is a separate matter than what the governor is on trial for and will not be part of current court proceedings.